Our Sunflower Pest Solutions resource offers insight on the pests that threaten yield and the products that can help you meet the quality and yield requirements of your sunflower contract. From pest descriptions to control recommendations, you’ll find the information you need to build a management plan that maximizes your profit potential. Banded sunflower moth. Source: North Dakota State University. Banded sunflower moths are a threat in all sunflower growing regions. While larvae are a pink-red color (and sometimes green), the adult moth has a dark brown triangular band over the middle of its wings. Most of their eggs are deposited on the outer whorl of seeds in the sunflower head and more may be laid on its underside. Larvae move in toward the face to feed on florets and pollen before feeding on sunflower seeds in advanced stages, with each individual insect attacking multiple seeds. Feeding larvae can prevent proper plant development and significantly reduce seed count, reducing yield and quality. 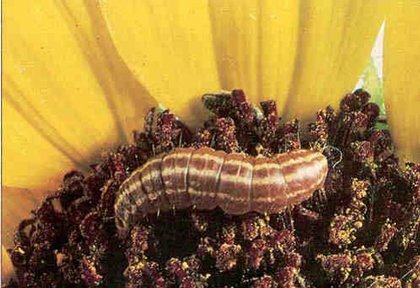 There are many different cutworm species that feed on sunflower, most often right after emergence. For most species, eggs laid the previous summer hatch each May or June. 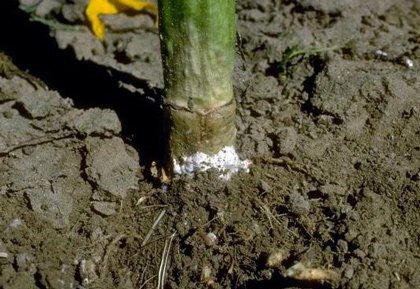 Cutworms can damage young plants above or below the soil surface by cutting through the stem and feeding on foliage. Cooler soils with high moisture inhibit sunflower development and tend to contribute to stand reduction and compound damage caused by cutworms. 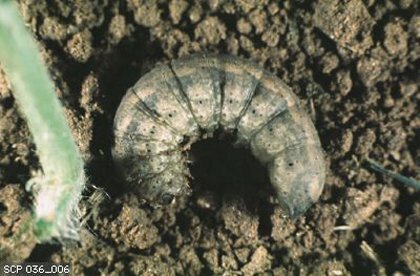 Most cutworm feeding activity occurs at night, usually remaining dormant during the daytime within a few inches of an infected plant. Red sunflower seed weevil. Source: The University of Minnesota. Gray sunflower seed weevil. Source: The University of Minnesota. 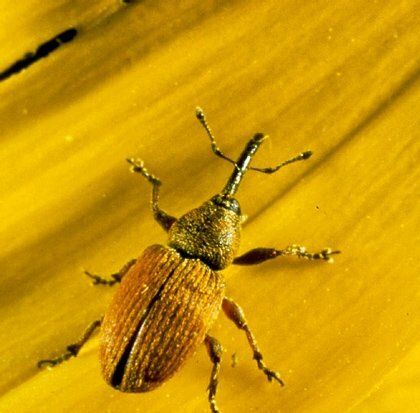 Weevils are the most common insect pest in sunflowers. The red and gray seed weevils, identifiable by their elongated “snouts,” cause little damage to young sunflowers when feeding on their developing bracts. However, both the red and gray seed weevil hatch and feed internally on sunflower seeds, which can cause significant yield loss. At ⅛-inch in length, the red seed weevil is slightly smaller than the ¼-inch long gray seed weevil. Typically, the gray seed weevil, more abundant in the South, will consume more of the sunflower seed than the red seed weevil, which is more common from the Appalachian Mountains to the Pacific Northwest. For the oleic market, both red and gray seed weevils ultimately reduce yield and test weight. In the confection market, damaged seeds are sold at a discounted price if over a predetermined damage threshold. Sunflower beetle. Source: The University of Minnesota. The sunflower beetle is a foliage-feeding pest exclusive to sunflowers and more common in northern growing regions. Sunflower beetles defoliate crops, which can lead to significant yield loss if young plants are attacked. Sometimes misidentified as the Colorado potato beetle, sunflower beetles are ¼- to ½-inch long with an arched structure and black longitudinal stripes on a white thorax. Cycling through only one generation per year, sunflower beetles hatch in late spring and feed for up to six weeks. Eggs are somewhat sensitive to environmental conditions, as they can dry out with periods of long, hot weather, and heavy rains can displace larvae from their host plants. Sunflower moth larva on sunflower head. Source: National Sunflower Association. Adult sunflower moth. Source: Kansas State University. 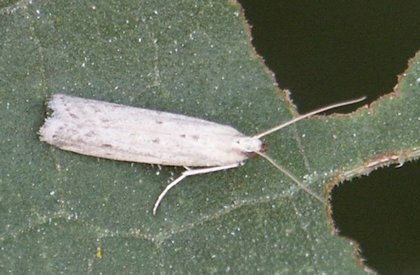 Adult sunflower moths are ¾-inch long, shiny and gray. 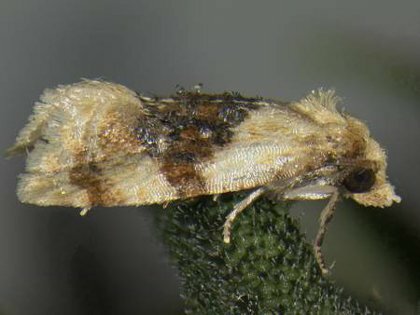 They begin to emerge from early May in warm climates to August in North Dakota and Canada, with higher intensity infestations in southern regions and the Great Plains. Larvae are brown with light longitudinal stripes on their back. Hatching on sunflower heads, early-stage larvae feed on pollen before moving onto plant and seed tissues, often leaving a trail of webbing across sunflower heads. Eventually, larvae can burrow in the flower head and feed on the ovary, preventing fertilization and resulting in empty seeds. Sunflower stem weevil. Source: University of Minnesota. Feeding on sunflower plant stems, the sunflower stem weevil is ⅛- to ¼-inch long, gray-brown with white spots and black antennae, snout and eyes. It usually emergences in May and June and is most common in the High Plains. 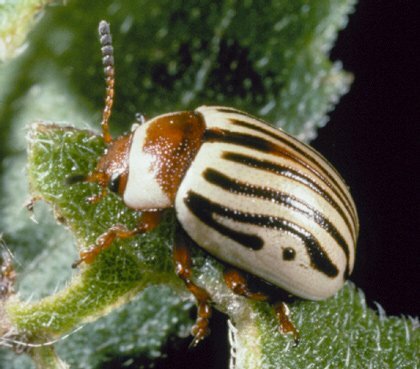 Adult sunflower stem weevils feed on foliage, which is usually not severe enough to require insecticide applications. However, larvae feed on the interior of the stem as they grow, which ultimately reduces yield through lodging and poor plant development. 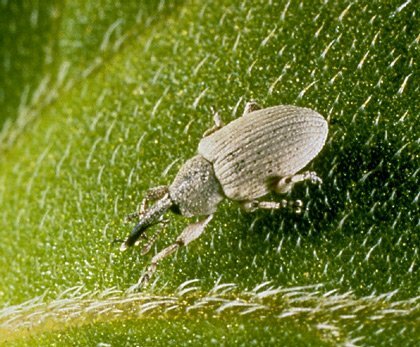 Sunflower seed weevils also vector the damaging Phoma disease, which can lead to lodging and early ripening, as well as cause more intensive damage when crops are under drought stress. Wireworms. Source: Kansas State University. 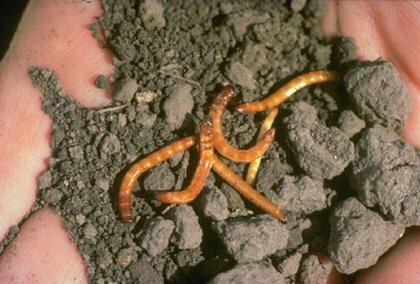 Wireworms are larvae of the click beetle family and thrive in cool, wet soil conditions. Yellow to brown-copper in color, wireworms are ½- to 2 inches long when mature. They inflict damage in sunflower crops by feeding on developing plant roots, which often results in poor emergence and leads to reduced yield in heavy infestations. Research suggests that reduced-tillage operations are susceptible to increased wireworm damage. Because adults like to lay eggs in grassy areas like wheat and grain fields, stubble and remaining crop residue from the previous season can be a good host for wireworm populations. 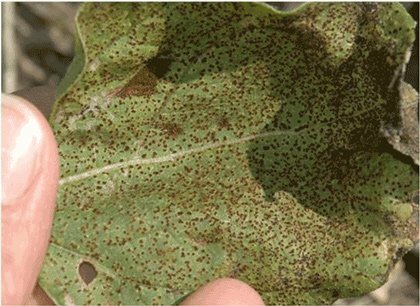 A sunflower leaf with Alternaria leaf spot infection caused by Alternaria spp. Source: Howard F. Schwartz, Colorado State University, Bugwood.org. 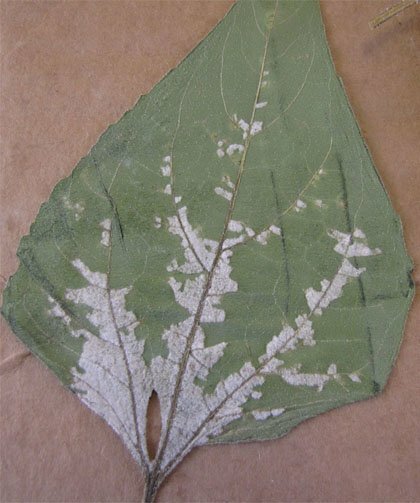 Alternaria is a fungal disease that favors hot, humid climates and produces dark spots on leaves that can coalesce, causing defoliation. High populations of Alternaria can result in up to 90 percent yield loss in subtropical growing regions. Infected plants form lesions on their leaves and stems, which can merge and kill entire leaves or cause stem breakage under the conditions favorable for disease development. Fungal spores of Alternaria germinate via free moisture on leaves and directly attack sunflower plants. Spores are spread via irrigation, wind and possibly insects. Alternaria favors seasons with high moisture content or crops under irrigation. Signs of downy mildew sporulation along veins on lower leaf surface of sunflower. Source: Purdue University. A result of the soilborne fungal pathogen Plasmopara halstedii, downy mildew can attack plants in two waves. The primary systemic infection is more problematic, while secondary infections caused by windblown spores from infected plants are usually not severe enough to significantly affect yield or quality. Systemic infections occur as the pathogen invades sunflower seedling roots, which often kills plants and causes significant stand reduction. When the disease is distributed sporadically across fields, unaffected plants often compensate to minimize yield loss. However, widespread infections can cause significant yield loss as healthy plants are unable to compensate. The pathogen thrives in cool, water-saturated environments and can stay in the soil for up to 10 years, so preventive measures are critical in minimizing the threat of infection. A sunflower field with Phoma black stem infection. Source: Howard F. Schwartz, Colorado State University, Bugwood.org. 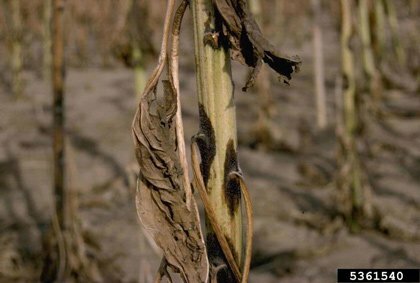 A sunflower plant with Phoma black stem infection. Source: Howard F. Schwartz, Colorado State University, Bugwood.org. Phoma black stem is the most common sunflower disease in the U.S. 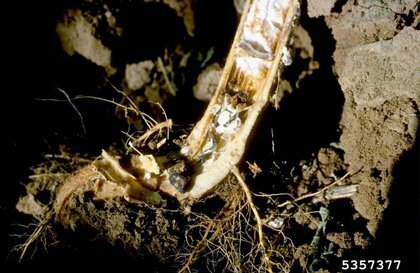 The soilborne fungal pathogen overwinters in plant debris and is spread via splashing water. However, Phoma black stem doesn’t usually cause major losses to yield or quality because infections are generally limited to the exterior of the plant. 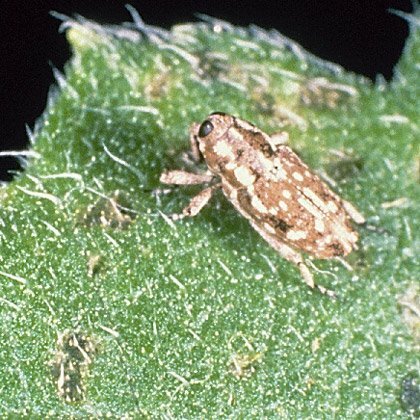 The disease can be spread by seed weevils while traveling through the stalk. Favoring wet conditions, Phoma black stem occurs most commonly at and following flowering. Sclerotinia head rot. Source: Province of Manitoba. Sclerotinia stalk rot. Source: University of Wisconsin Cooperative Extension. Sclerotinia Basal stalk rot. Source: Forestry Images via Colorado State University. 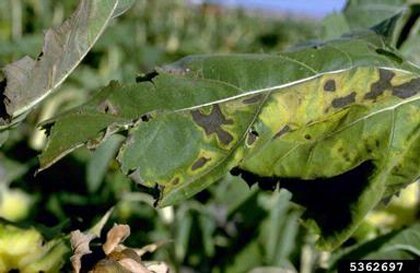 Sometimes called white mold, Sclerotinia can be one of the most devastating diseases for sunflowers under weather conditions conducive to disease development. The disease advances and thrives in wet, cloudy conditions and can stay in the soil for several years. Wet soil for 10 to 14 days can allow Sclerotinia to produce thick-walled sclerotia, which germinate and produce tiny mushroom-like fungal growth called apothecia. Spores from apothecia are then carried via wind to infect sunflower plants by activating with water on dead or senescing plant tissue. 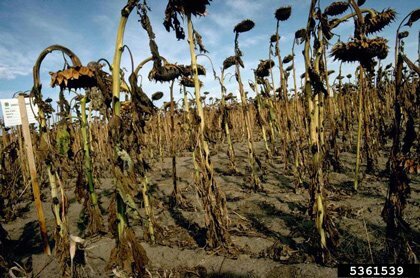 The disease is absorbed by sunflower roots, immediately killing or severely wilting plants. Sclerotinia can result in three different diseases, depending on the pathogen: basal stalk rot and wilt, mid-stalk rot and head rot. Sunflower rust pycnia. Source: North Dakota State University via Bob Harveson, University of Nebraska. Sunflower rust aecia. Source: Sam Markell, North Dakota State University. Sunflower rust uredinia. Source: Sam Markell, North Dakota State University. Generally affecting more sunflowers in the confection market than the oil market, sunflower rust is a soilborne fungal disease resulting from the Puccinia helianthi pathogen. 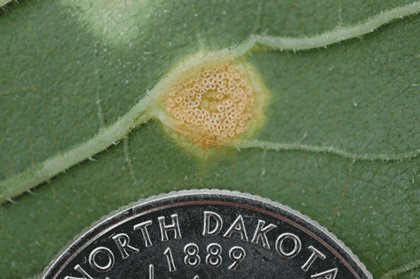 Sunflower rust favors hot, humid conditions. At least two to three hours of leaf wetness are required for sunflower rust to infect plants. Pathogen spores germinate between 55° and 85° F – as temperatures increase, so does the rate of new infections, which can occur every eight to 14 days. 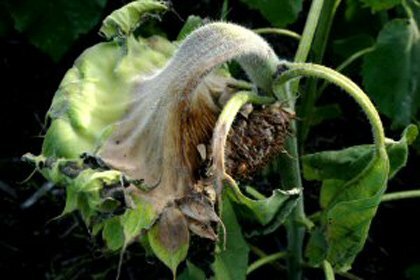 While moisture content then becomes a non-issue for infected sunflower crops, high temperatures are conducive to the development of the disease. 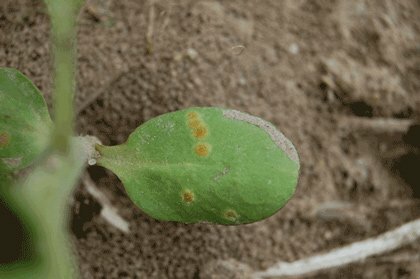 Sunflower rust has a significantly greater impact on sunflowers before bloom, causing up to 40 percent yield loss, while sunflowers infected after bloom experience up to 10 percent yield loss. Kochia at the 3- to 5-leaf stage. Source: University of Minnesota Extension. Kochia. Source: North Dakota State University. 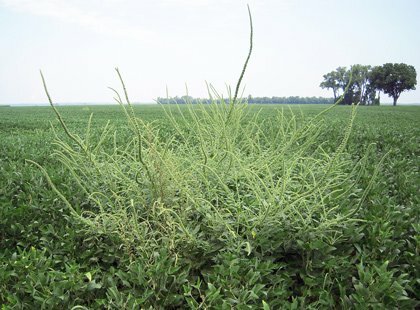 Kochia is a serious weed problem in many sunflower-growing regions, particularly in instances where it has developed resistance to glyphosate, auxin and ALS-inhibitor herbicides. Hardy in cold weather when it emerges in early spring, kochia can also thrive in hot weather and is able to germinate in temperatures exceeding 100° F. When the bush-like weed isn’t competing with crops or other plants, it can grow up to seven feet tall and develop extensive root systems. Kochia fertilizes itself, and each plant can produce up to 15,000 seeds. When mature, an abscission layer develops near the base of the soil, which can cause the plant to break off in the wind and spread seed by blowing across a field – it is known as a tumbleweed. Palmer amaranth. Source: Purdue University. Palmer amaranth has become one of the most common weeds infesting sunflower fields across the High Plains. Part of the pigweed family, Palmer amaranth seedlings emerge from the red-brown seeds in May through July. Palmer amaranth plants can photosynthesize more efficiently than most crops and are able to develop rapidly even in hot, dry conditions. Mature plants are dense and compact, with red-purple petioles longer than its smooth, glossy leaves. 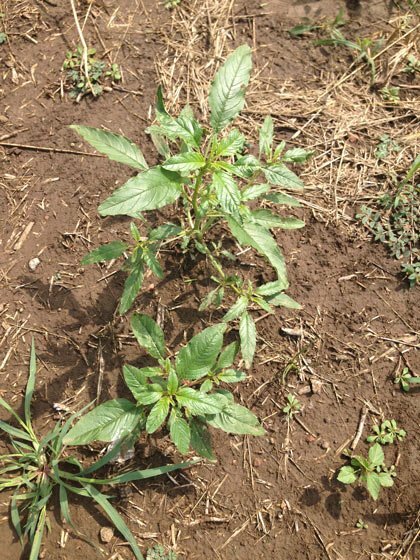 Palmer amaranth is an increasingly problematic weed for sunflower growers, as it has shown resistance to glyphosate and ALS-inhibitor herbicides over the past decade. According to Kansas State University, even moderate Palmer amaranth infestations can result in more than 50 percent yield reduction. Waterhemp. Source: University of Missouri. Waterhemp is a common, genetically diverse weed that has been able to adapt to modern weed control practices, which includes having developed resistance to glyphosate and ALS-inhibitor herbicides in some areas. 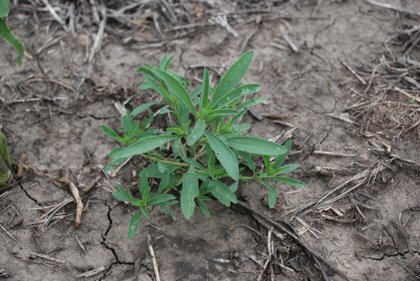 Thriving in wet conditions, waterhemp seedlings are hairless with lance-shaped leaves that appear waxy or glossy. Waterhemp can range between four inches and 12 feet tall but are usually around four to five feet. The plant is generally green, but can also have distinctive red stems in some areas. Despite their small size, waterhemp seeds are viable in the soil for several years and grow rapidly. 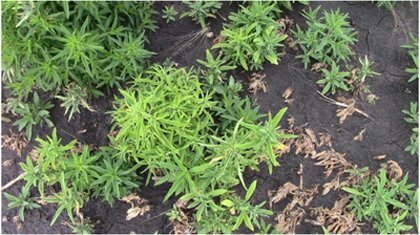 Waterhemp can be very damaging because of its ability to grow many plants in a small area. ©2016 Syngenta. Important: Always read and follow label instructions. Some products may not be registered for sale or use in all states or counties. Please check with your local extension service to ensure registration status. Besiege, Gramoxone SL 2.0, Karate with Zeon Technology and Warrior II with Zeon Technology are Restricted Use Pesticides. Besiege, Karate with Zeon Technology and Warrior II with Zeon Technology are highly toxic to bees exposed to direct treatment on blooming crops and weeds. Do not apply these products or allow them to drift onto blooming plants while bees are foraging adjacent to the treatment area. CruiserMaxx Sunflower is an on-seed application of separately registered products containing Cruiser 5FS insecticide and three fungicides: Apron XL, Maxim 4FS and Dynasty. Apron XL®, Besiege®, Cruiser®, CruiserMaxx®, Dual Magnum®, Dynasty®, Gramoxone®, Karate with Zeon Technology®, Maxim®, Quadris®, Sequence®, Warrior II with Zeon Technology® and the Syngenta logo are trademarks of a Syngenta Group Company. Bion® is a trademark of Merck KGaA.